Spacious Home on 250 Private Acres! Best Views in the Area and Great Location! 3 Bedroom, 2.5 Bath Home on 250 Private Acres with Beautiful Views! We welcome you to Plumlea Farm - a vacation home that you'll truly remember long after your stay has ended! 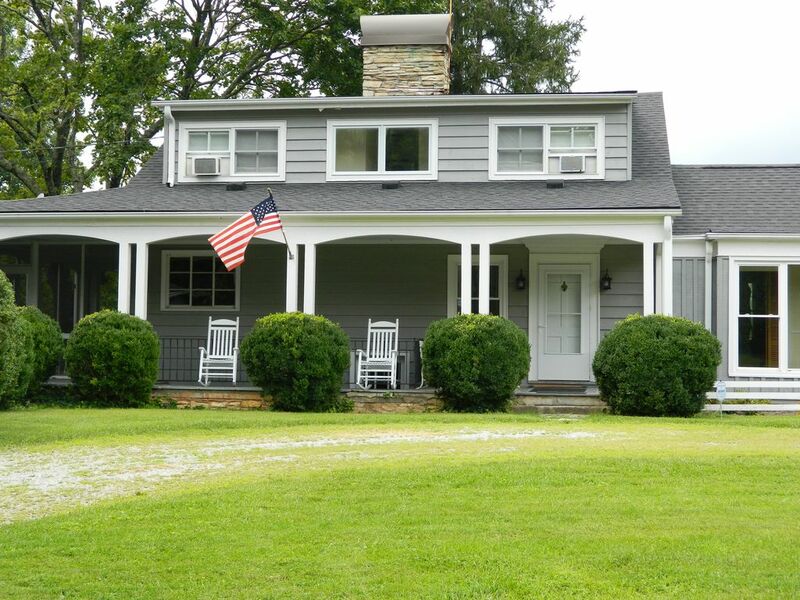 This charming home on 250 private acres is located only 18 minutes from both Asheville and historic Hendersonville and offers some of the most breathtaking views you'll find in the area. You'll enjoy close proximity (maximum 20 minute drive) to wonderful area activities and sightseeing such as the Blue Ridge Parkway, Biltmore Estate, Sierra Nevada Brewery, Downtown Asheville, Hendersonville, Lake Lure, Chimney Rock, hiking, mountain biking, fly fishing, golf, kayaking, and many superb Asheville restaurants (numerous brochures detailing popular local activities, restaurant menus and area maps are in the home for your convenience). Within a mile from our home, you can also enjoy the running/walking trails, basketball courts, baseball fields and playgrounds of beautiful Fletcher Park. Our location is absolutely ideal during leaf season with gorgeous views from every window of the home! Plumlea also has a sizable covered front porch which offers a peaceful area to enjoy bird watching, spot a wild turkey or deer, read a book from our extensive library or simply take in the breathtaking views and relax in our rocking chairs. You may also choose to spend your time hiking on the expansive private acreage with great long range views of both Mount Mitchell and Mount Pisgah. For your reading pleasure, hundreds of books await, including popular fiction and nonfiction titles, books on the Asheville area and an extensive selection of Civil War and WWII history books. In the mood for a good movie or board game? We have over 60 popular adult and children's DVD titles and a number of fun family board games and puzzles. The comfortable living room easily seats six with a couch, loveseat and 2 recliners. The living area flows into the dining room with formal seating for six. Just down the hall is our cozy den where you'll find a queen sleeper sofa next to the half bathroom. This room is perfect for an extra guest or babysitter to enjoy an area of their own with doors that close from the hallway for added privacy. Our fully equipped kitchen contains a dishwasher, refrigerator, microwave, toaster oven, programmable coffee maker, French Press coffee maker and a full array of cooking utensils and spices. Additionally, one of the unique features of our home includes direct access from the kitchen to the screened-in porch for casual outdoor dining with a table and chairs for 4. Whether you're up for an exciting and on the go vacation filled with many unique activities or simply a quiet and relaxing time away from all the hustle and bustle of everyday life, you'll find your ideal retreat at Plumlea Farm. One of the unique benefits of our home is that it's located on 250 acres so you truly feel secluded without being in a remote location. There's a 24 hour Ingles grocery store, several great restaurants, a Starbucks and a wonderful public park, all less than 2 miles from the home. Downtown Asheville and the Biltmore House are both an 18 minute drive down Route 25, along which you'll pass many restaurants, lots of shopping and great family activities. If you decide to take things at a slower pace, you can enjoy reading one of hundreds of available books on our screened in porch or try our relaxing tree swing You can enjoy a vacation of complete relaxation or one that's packed with activities - our location offers the best of both worlds! Internet for up to 6 devices is provided through a mifi mobile hotspot and is best suited for email and web surfing. Not a good fit for heavy video streaming and/or gaming. White cotton towels provided for your stay including bath towels, hand towels and washcloths. Sizable covered front porch with 4 rocking chairs and a fantastic view! The driveway going up to property was washed out due to all the rain we had this week but owners were going to regrade after we left. The setting was beautiful and owners were very helpful. Loved the porches! Much better than a hotel. Cathy - we were so glad to hear that you enjoyed your stay and completely agree with you that it's nice to relax in a home versus a small hotel room! We also wanted to apologize again for a few parts of the driveway becoming rutted due to the very heavy rains that unfortunately occurred during your rental week. Asheville hasn't had that much rain in one week in several years but I can assure you that the driveway has been regraded and is now good as new. We hope to see you again in the near future! A breath of fresh air and serene views! The farm was stunning! Sitting on the front porch enjoying the meadows and forest of this lovely farm really helped release the stress of every day life. The house is immaculate and the kitchen had everything we needed. I enjoyed viewing the history of the farm through the photos and books displayed in the home. If you are looking for a peaceful retreat this is it. Wow! My husband and boys had such wonderful time at Plumlea Farm! Every comfort is fully stocked and available, the floor-to-ceiling windows in the living and dining area offer the perfect experience of the rolling lands surrounding and the kids spent half their time on the terrific tree swing conveniently within sight of the kitchen window to bring smiles to food prepping faces. The local area has much offer, as well as near endless possibilities for activities and restaurants within a 30 min drive. Jody and Fletcher provide everything you need in the way of brochures and suggestions, and are readily available should you need anything at all. The house manages to feel full of history and entirely comfy and provides plenty of space inside and out to really stretch your legs and mind out from the busyness of daily life. Highly recommended, we'll definitely be back. Thanks again for everything! We returned to Plumlea 2.5 years after our first visit and found even more to love. The owners recently added a new tree swing that was the focus of attention for my two young children. The farm is beautiful, and we had fun exploring the property and greeting the cows, horses, and turkeys. Location is perfect for quick trips to Asheville and the surrounding sights. The owners are responsive and helpful. We love feeling like we are in a real home with history, and the house is well stocked. Thanks for another great week- hope to return to make memories here again someday! A spacious home on a hill surrounded by a great community. The house is spacious, plenty of room for common areas, great working kitchen with necessities and more. Large glass windows allowed us to view the hilly scenery outside. A giant back and front yard allows for recreational time for the whole family. In total, the house was a big success and a great convenience for our family. The owner is very nice to work with, we needed to adjust our length of stay after booking the house. Jody had accommodated to our schedule and refunded us, which we really appreciate. The restaurant and attraction recommendations were emailed to us prior to our trip , flyers and brochures are provided at the house.This really help to make our trip more efficient with the time we have. There are also ton of books, DVD and board games for us to enjoy. We had a really great stay and definitely plan to come back and Fletcher is a nice community with many conveniences. Plumlea is a very warm and cozy getaway. Clean spacious and private. Just what we were looking for in a VRBO. The Biltmore House, Fletcher Feed and Seed (nationally acclaimed family friendly bluegrass music) Chimney Rock, Lake Lure, Blue Ridge Parkway, fantastic Asheville restaurants, golf, fly fishing, hiking, kayaking, biking trails, Asheville Fun Depot and Asheville Children's Museum are all within a 20 minute drive. Several grocery stores, coffee houses, restaurants and shops are less than a 5 minute drive from the home. **Special locations of interest: WNC Agricultural Center (home of NC State Fair in September) is a 10 minute drive from our home while the Tryon International Equestrian Center is 31 miles away from our home. **Please inquire directly with owner about our holiday rates covering Memorial Day, July Fourth, Labor Day, Thanksgiving and Christmas as well as special discounted rates for returning renters. Please also note that if you choose to pay by credit card, the 3% processing fee we are charged by the card issuer on the rental amount will be deducted when we refund your damage deposit. Payment by the "echeck" option is free and no fees are assessed.